The Central Time Zone, as its name suggests, covers most of the central United States and extends up into Canada and down through Central America, as well as covering some of the Caribbean Islands. This is one of nine standard time zones used in the United States and its territories. The Central Time Zone covers more US states than most other time zones and was introduced alongside the other three major time zones in the late 1800s. The Central Time Zone covers nine states in their entirety was also applying in small to large parts of 11 additional US states, for a total of 20. This time zone also applies in some parts of Canada and the vast majority of Mexico, as well as several Central American countries and Caribbean Islands, including Costa Rica, Honduras, El Salvador, and Guatemala. The biggest US city in the Central Time Zone is Chicago, with a population of around 2.7 million. Other major cities in this time zone include Houston, San Antonio, Dallas, and Austin, all in Texas. Back before the introduction of time zones in the United States, towns and citizens would have to use the sun to set their clocks. When the sun was at its highest point in the sky and crossed over the meridian, clocks would be set to midday. Naturally, this meant that the time could vary from one town to another and especially from one state to the next. As time went by, this issue proved to be increasingly problematic. This was especially the case when railroads and communications lines started to spread around the US and people needed to travel more and communicate with different cities and states. Establishing reliable train schedules was almost impossible given the way that each town and city would have its own time, so passengers were often confused and the railroad authorities didn’t know what to do. Eventually, they introduced a system of 100 railroad time zones spread out across the US to try and establish some kind of order. That system helped a little, but wasn’t good enough. So, in 1883, four major time zones were established. The borders and limits of the Pacific, Mountain, Central, and Eastern Time Zones were defined and, on November 18 of that year, telegraph signals were sent out to major cities in each time zone in order for the clocks to be set at the new times. From that point on, timekeeping in the US was much simpler. 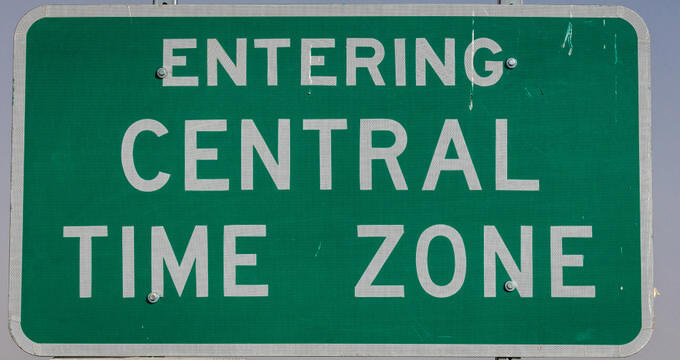 The Central Time Zone (CT) is split into two forms: Central Standard Time (CST) and Central Daylight Time (CDT). The former is six hours behind Coordinated Universal Time (UTC) while the latter is used during periods of daylight savings time and is five hours behind UTC. Central Daylight Time is used from March through until November in areas where daylight savings time applies, while Central Standard Time is used for the remainder of the year. Minnesota, Louisiana, Iowa, Alabama, Arkansas, Missouri, Wisconsin, Illinois, and Mississippi are the nine states that are completely covered by the Central Time Zone. This zone also covers parts of Kansas, Nebraska, Oklahoma, Florida, Indiana, Kentucky, Tennessee, Michigan, North Dakota, South Dakota, and Texas. Outside of the US, Central Time applies in almost all of Mexico and multiple Central American countries, as well as various islands. The Manitoba province in Canada also entirely observes Central Time, along with parts of Saskatchewan, Nunavut, and Ontario. The notion of moving the clocks back and forward in the United States to adapt to changing sunrise and sunset times over the course of the year was first suggested by Benjamin Franklin in the late 18th century. However, the country would have to wait until 1966 for genuine federal action on the matter. The Uniform Time Act was introduced in that year and a system of daylight savings was installed. In the Central Time Zone, this meant that the clocks went back one hour on the first Sunday of April and forward on the last Sunday in October. In 2005, these dates were adjusted to save additional energy through the Energy Policy Act of 2005. This means that the clocks now go back on the second Sunday of March and forward on the first Sunday of November, putting the Central Time Zone into CDT during the summer. CDT is used in most of the Central Time Zone, with Saskatchewan in Canada being the one major exception to this rule.